LIPS© Chocolate Valentine's Party at Faena Art Forum on Valentine's Day 2019. An immersive, sensorial experience will bring over 20 artists and performers to show their art pieces and auction them off with an interactive presentation. MIAMI BEACH, Fla. - Feb. 8, 2019 - PRLog -- Experience the LIPS© Chocolate Valentine's Party at FAENA Forum on Thursday, February 14th from 6-9pm. 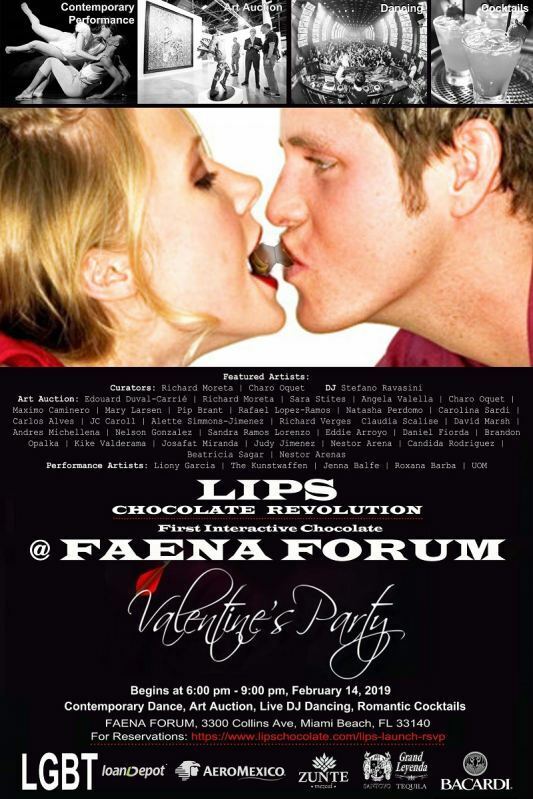 Guests will enjoy a memorable product launch and event for LIPS© Chocolate taking place at the Faena Art Forum on Valentine's Day, located at 3300 Collins Avenue, Miami Beach, Florida 33140. This immersive, sensorial experience will bring over 20 artists and performers to show their art pieces and auction them off. In addition to art and performances, the LIPS© Chocolate Exhibition will include an interactive presentation and exhibit for attendees to learn, enjoy, and connect, as well as a live DJ performance and open dance floor. What is LOVE? Universal Love, beyond the ordinary…beyond separation. beyond prejudices. This Valentine's Day experience the LOVE and oneness like never before. Meet the most inspiring people, indulge in the music, art pieces and dance performances by the best artists Miami has to offer. Submerge in the one-of-a-kind Faena Forum space. Create the most exquisite experience of sharing by LIPS Chocolate, enjoy a combined exhibition of three of the greatest things in the world… Art, Music, & Chocolate. Tickets Include on the house drinks and cocktails from LIPS Chocolate sponsors, a phenomenal art exhibition with an opening contemporary dance performance, auction and fundraiser + a live DJ performance and open dance floor. VIP Tickets also include, VIP auction seating with the Forum, and complimentary LIPS Chocolate.